Some movies linger in our minds for some time; some get blown away by an upcoming blockbuster breeze. And then there are those movies that not only stay with us forever but also transcend the taste barrier and become a work of art, a piece that will follow its viewers forever and be known as a medium that stated something important for the future generations. These films created the notion that moving visual imagery is an art that can be mastered by some more than others. They are a legacy of the human kind, emotions weaved into rolls of film, stories of the bold and the weary, feeble and crazy, young and old, funny and humorless. They are human life itself portrayed in art, delicately created from the mere human thought. This film is routinely named the best film of all time, almost by default, in list after list for decades. What is it about this film that it captivates us as much as any Renaissance painting? Well, for starters, it tells of all the seasons of a man’s life, his weaknesses and hurts. Everyone remembers him but no one can explain him. It ends its search for “Rosebud,” his dying word, with a final image that explains everything and nothing. This film is complex not only for its story but for the very way it was made. The film has a breathtaking skill at moving from one level to another and sequencing from one scene to another using sound as his connecting link. 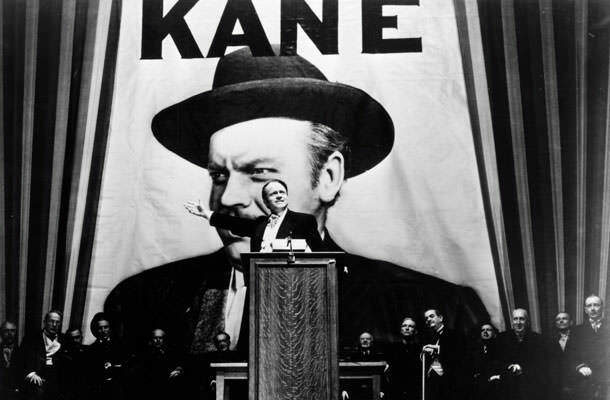 The piano playing of Kane’s friend Susan leads into their relationship, his applause leads into his campaign, where applause is the bridge again to a political rally that leads to his downfall, when his relationship with Susan is unmasked. This particular movie is not just a work of art in that case, but an innovation as well.